In keeping with our mission to promote the culture of Bavaria through folk dancing, costumes, and traditions, Enzian Schuhplattler voted in 2011 to purchase a custom-made Vereinsfahne from Germany.A Vereinsfahne is a four-foot-square velvet flag, hand-embroidered with symbols meaningful to our Verein (club). 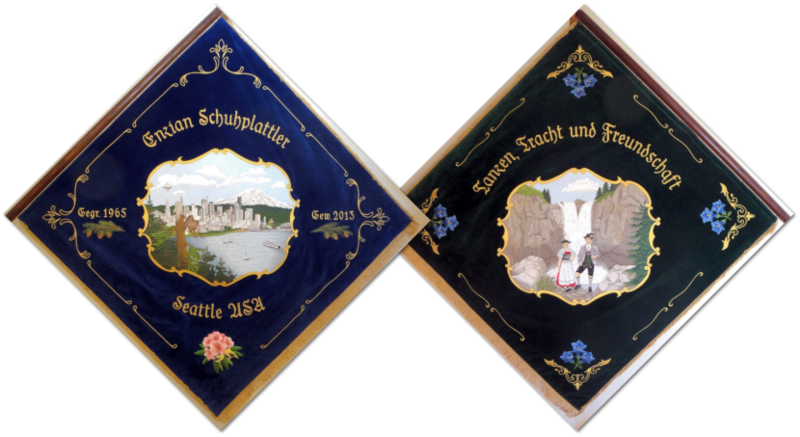 One side of the flag features a couple wearing our Tracht (costume), along with the date the club was founded and the date on which the flag was dedicated. The other side features an artistic rendering of geographical and architectural features that evoke the Seattle area—notably, Elliott Bay, the Seattle skyline, Mount Rainier, and the Space Needle, among other things. The process of designing and making the flag takes about a year. Our new Fahne arrived on July 3, 2013, and was dedicated and then displayed at our Fahnenweihe on September 1, 2013. 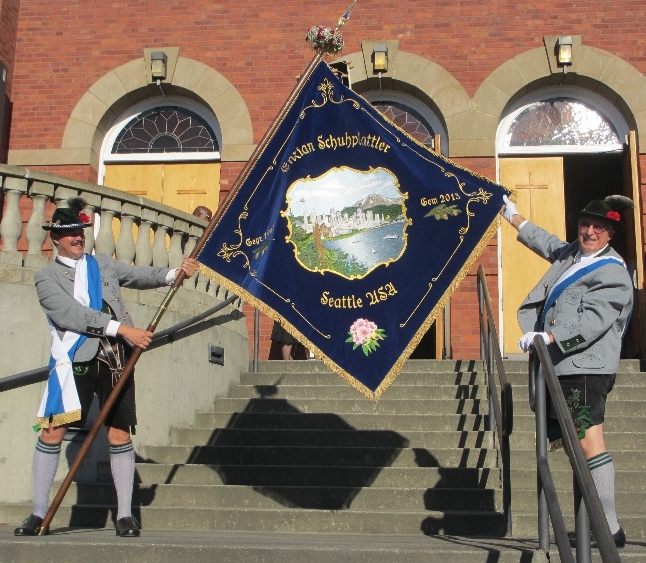 The Fahne made its German debut in September of 2014, when it was carried in the Oktoberfest parade by Fahnenträger Sean Schmidt, with Reid Champagne and Toni Auer assisting. Our 1. Vorstand, Carolyn Marquardt, also walked in that parade. All clubs in Bavaria—Trachten clubs like ours, but also bands, shooting clubs, religious organizations, and the like—have one of these Fahne. A Fahne represents the heart and soul of a Verein, and it pictures for the world the things that the Verein holds dear. It is a rallying symbol for the club. The Fahne will be carried in parades, exhibited at Gaufeste (both here and in Bavaria), and will be displayed at other events where appropriate. A Fahne, if properly cared for, may last fifty years or more. Because Fahnen are handmade and feature substantial quantities of embroidery, they cost around $10,000, so this was a large undertaking. We have worked with club member Chris Barnes, artist par excellence, to design the Fahne, and he did a wonderful job.